Adrian Clarke looks at the key tactical battles in Matchweek 16. Wolverhampton Wanderers’ form and style of play has fluctuated this season. They have raised their game against the biggest clubs, beating Chelsea, drawing at Manchester United and Arsenal, and holding champions Manchester City at Molineux. By closing down well in packs and keeping a good shape Nuno Espirito Santo’s side are proving awkward opponents for sides above them in the table. Averaging 30.9 per cent possession across those four encounters but breaking with incisiveness, Wolves are a strong counter-attacking unit. But, when the onus has been on them to control matches in possession, Wolves have been less comfortable. This was shown in defeats by Cardiff City, Huddersfield Town, Brighton & Hove Albion and Watford, who all succeeded in knocking them off-balance. Wolves found themselves unsettled by aggressive pressing and laboured with and without the ball. Perhaps to avoid being hounded in possession, Wolves have developed a more direct style in recent weeks. They have increased their share of long passes from 14.9 per cent in their first nine matches to 20.9 per cent over their last six fixtures. No longer do they play through the lines as often. It will be interesting to see whether Newcastle United mimic the success other teams have had against Wolves in recent matches and force them to go long. 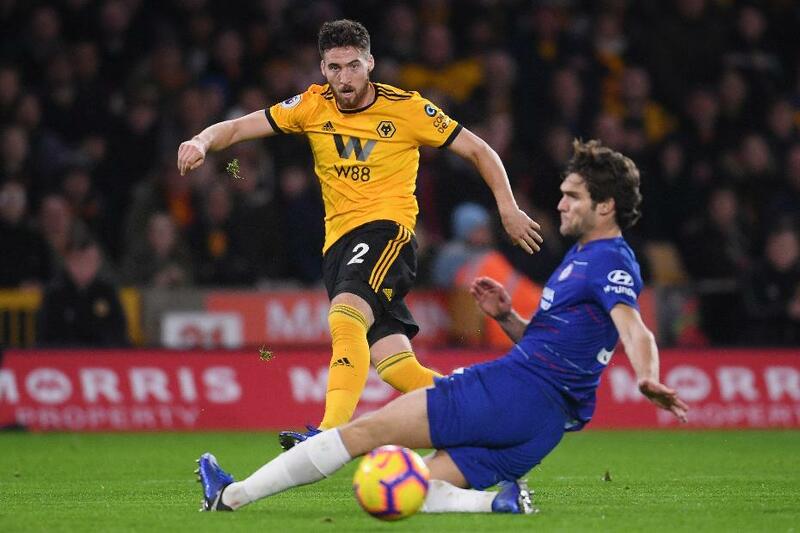 One player who has taken the Premier League by storm is Wolves’ most consistent performer, Matt Doherty. The wing-back has excelled at choosing the right moments to push on and is most effective when catching out opposing wide men. The Irishman waits for lapses in concentration or imposes his will on his markers by dragging them back towards their own goal. Doherty’s stats are remarkable for a defender. He has enjoyed 45 touches inside the opposition penalty area, the most of any Premier League full-back and second only to striker Raul Jimenez at Molineux. He has delivered 36 crosses from open play, the most of any Wolves player, having a respectable 25 per cent accuracy rate. Doherty has also created 20 chances, 14 of which have been from open play. Only midfielder Joao Moutinho has bettered that tally, with 28. Scoring twice, making three assists, and getting his crosses and shots away with great frequency, he has made a huge impression. When Doherty and his fellow Wolves wing-back, Ruben Vinagre, play with confidence, they are superb at stretching play for Wolves. Newcastle’s left-sided players must focus very hard on containing the Irishman’s forward bursts. He is capable of delivering real quality and more often than not is Wolves’ most dangerous outlet.